It took 12 years and nearly all of the Canal company’s funds to complete the Paw Paw Tunnel. The tunnel was built to save five miles of construction by cutting across a neck of land formed by the Paw Paw bends. What resulted was the most notable landmark on the Canal – at three-fifths of a mile and 5,800,000 bricks in all. Riots, strikes, discontent, and eventual arrests defined the 12 years of labor on the Paw Paw Tunnel. Lee Montgomery led Irish and English workers who attacked each other and German workers at a work camp downstream. Despite these outbreaks of violence, Montgomery and his men drove a tunnel through the ridge in the 1840s. It was not completed or ready for use until the 1850s. When traffic finally did travel through the tunnel, it often resulted in bottlenecks, as turning or passing was impossible. Boats would light a red lantern on the stern and a white lantern on the bow so other boats would know which way it was traveling, and boats headed downstream would yield and back out of the tunnel. On one occasion, neither boat would yield and the stand-off lasted for a few days until workers started a fire upstream to ‘smoke’ them out. 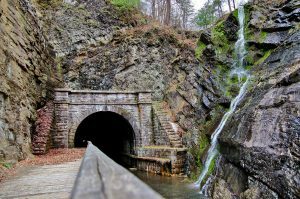 The Paw Paw Tunnel is a Canal Discovery! Read a Park Ranger’s story and view other multimedia on our Canal Discovery page.